This season this talented actor joins the cast full time. We chat about what is ahead in season three plus her career including working with Jennifer Garner and her aspirations to be a Disney Princess. I spoke to this talented artist about the creation of this series about a serial killer haunting a small town. This is episode one of my Women's Work podcast series. A musical outlook at the new SyFy Series with its composer. Pinar has worked on Justice League, Falling Water and the video game, Fortnite. Talented actor who plays Ryn, the aquatic Siren from the Freeform series. We chat about the challenges of the role plus her stint on Game Of Thrones. I interviewed the cast and their director in a roundtable setting and also covered the red carpet. This is a compilation of these interviews that include director Mitzi Peirone and her actors, Madeline Brewer, Sarah Hay, and Imogen Waterhouse. Plus I chat with composer Michael Gatt. From the red carpet I chat with actors Nadia Alexander who plays Mina, Toby Nichols who is Alex and their director Justin P. Lange. Then at the Roxy Hotel, I hosted a roundtable with Justin P. Lange and Nadia Alexander on this interesting horror character film. The former Person Of Interest actor plays Mara Kint, an ex-detective now college professor who specializes in human behavior is brought in to help people trapped in their fantasy lives in a virtual world before their bodies break down. Pioneering podcaster who along with friends started Slice Of Sci-Fi when podcasting was young. The series is still on having your favorite SF celebrities and indie filmmakers. We chat about the podosphere, the podcast and what we like in geek entertainment. Visit Slice Of Sci-Fi for more. Get the Radio Public App to Sci-Fi Talk on the go. She has worked in the DC and Marvel animation universes in addition lending her vocal talents to the Mass Effect, Far Cry and Warcraft gaming universes. We chat about her roles in Suicide Squad Hell To Pay and her upcoming Lego DC Super Villains video game. I chat with Lynly Forrest who is the editor and publisher and her colleagues, Kelly Sue Milano who is the head writer/VP of Development and Lisa K. Weber who is the artist and Creative Director. 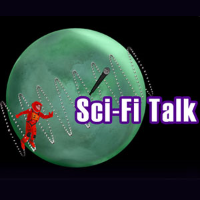 Visit their official site Listen to Sci-Fi Talk at Radio Public. Talented actor talks to me about playing Barbara Robinson in Mr Mercedes. She also talks about her role in The Last Ship plus the upcoming in What Still Remains. Interesting series about an Elfin woman who could save her planet by first time author Hollis Jo McCollum. We chat world creation, her fantasy influences and her love of cosplay. She's a journalist, attorney, storyteller, and podcaster. She is Angelique Roche' who talked to me before the first episode of Geeksplain aired. We chat about diversity, what she had planned for Geeksplain and Richard Matheson's I Am Legend. We chatted via Skype from her home in the United Kingdom. We talk about her new novel series, Avaland. She delves into a fantasy world where magic and competition go hand in hand. We chat about her novel and the character front and center is Lulu who could literally save a planet. Talented actor looks back at her turn as Supergirl and also how she has voiced and starred as other characters in the DC Universe. Record at SDCC. Actor talks about the upcoming season and what is ahead for her character of Michael Burnham. She touches upon Burham's relationship with adoptive brother, Mr Spock. Roundtable recorded at NYCC. We chat about the new adventure from time traveling Charley Morton's science project that hurls her back to meet Leonardo Da Vinci in Da Vinci's Way. Actor who is well known to horror fans stars in Bloody Ballet. We chat about her career and the various textures of fake blood.